In these troubled times, artists seriously consider to stop making CDs and just release songs on myspace or itunes or whatever. 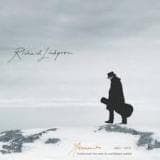 Swedish singer/songwriter Richard Lindgren goes the other way. His fourth album A Man You Can Hate is a double CD with 18 new original songs.All involved in this project are of course well aware that this is probably not the smartest move right now, but sometimes you have to defy common sense and just go with your gut feeling.And the gut feeling in this case says that A Man You Can Hate is an important piece of art. 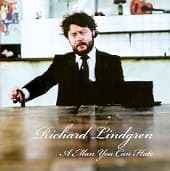 Both discs, all 18 songs.The music might be traditional in the Dylan/The Band/Young/Springsteen sense, but Richard Lindgren reaches new levels. As a singer and as a songwriter. We're not talking any light hearted feel-good songs here. In his songs Lindgren deals with love, hatred, loss, self loathing, doubt, dreams and nightmares. It's dark, almost scary, but still enjoyable in a strange way. Much thanks to the dark humor. 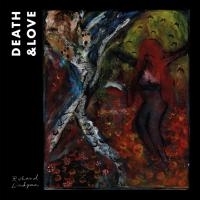 "Death and Love" is the Swedish singer/songwriter Richard Lindgren's 11th album since the debut back in 1996 and the first one since the acclaimed "Malmostoso" from 2016. It's been a few years and it might be tempting to think that the Poet has been lazy. But not at all - on the contrary, it's been a very creative period for Richard. But due to circumstances beyond his control, he's not been able to spend as much time in the recording studio as he would have needed to get all his new songs on tape. Richard lost both his parents in recent years and he had to deal with his grief and a lot of practicalities. A house to take care of, in need of re-roofing, and wood to cut... While dealing with all this, Lindgren wrote some of his best songs so far. Songs of darkness, grief and death. But also of hope and love. And and en ever present dark sense of humor.Death and Love was produced by Magnus Norrenberg and features his regular touring band.While living in the countryside and minding the inherited house, Richard sometimes got restless and decided to give painting a try. The front cover is a piece by Richard and the back is a cooperation with his 12 year old niece Nora. TRACKLISTING: 01. Death And Love 02. Down On My Luck 03. Turnstile 04. Jilted Love 05. Bad Habit 06. Travels With Johanna 07. Tell Dita (i Love Her) 08. Charley Battles Blues 09. First Kiss 10. Drunk Tank Boogie 11. Where Did You Go, Little Boy? In 2012 Richard Lindgren received a songwriter award from the Live at Heart organization. One week at nice hotel and to write new songs and afew days in a studio to records. Here's the result. Driftwood (the 309 Sessions) is a beautiful collection of six new originals, the traditional folk song I Wish I Had Someone To Love Me and a take of the Mississippi John Hurt classic Make Me A"
Grace is another masterpiece by the brilliant Swedish singer/songwriter Richard Lindgren.If the lyrics are dark and sparse, the musical environment is joyful and exciting. The producer Magnus NGrace i Lin Hi fiYou could say that this is an album about divorce. And yes, here are several songs on lost love and breaking up. But here's also a light at the end of the tunnel. Instead of self pity, Richard displays a sense of dry, dark humor:If the lyrics are dark and sparse, the musical environment is joyful and exciting. The producer Magnus Norrenberg has pushed the boundaries. The basic singer/songwriter rock meets gospel and New Orleans brass and even some Caribbean rhythms occasionally.Grace is the fifth studio album by Richard Lindgren. His first album was released in 1994 and since then he's been touring, writing and recording without any breaks. His most recent studio album, A Man You Can Hate, was released four years ago. In 2010 the retrospective box set Memento was received by massive critical acclaim. When Richard Lindgren a few years ago was invited to tour Italy it was the beginning of a beautiful friendship. A couple of wonderful songs came out of it, for instance the magnificent Sundown On A Lemon Tree, but some of suspected that this new found friendship would fade away, due to physical distance and language barriers. We were dead wrong. For Richard Lindgren it was only a beginning and with the new albumMalmostoso the friendship with Italy seems to develop into a love affair.Malmostoso was recorded in Pavia in the north of Italy, not to far from Milano. All the musicians, with a few exceptions, are Italian and most of the songs were written in or inspired by Pavia.The album title Malmostoso is actually not referring to Richard's Swedish home town Malmo. It's a local Italian expression, meaning something like sad and gloomy. Maybe it's the new surrounding that triggered Richard Lindgren? Maybe it's playing with it's playing with musicians with a slightly different approach that inspired him? Regardless, Malmostoso - Richard's 10th studio album - is nothing less than a masterpiece. 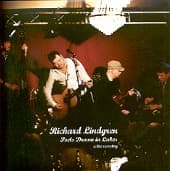 The songs are powerful, the arrangements and the performances by all involved are top notch.Richard Lindgren is one of the best and most consistent songwriters in Sweden, even in Europe. Over the past 20 years he's recorded somewhere in between 130 and 150 songs of outstanding quality. The Richard Lindgren 2011 box set Memento is now a collectors item. It was only released as a limited edition and it's available no more. But to make some of the brilliant rarities from the box set available for a wider audience, we decised to release a condensed version. One CD, 14 tracks and 76 magical minutes of music at a low price! April 15 Richard Lindgren played an unique solo show in his hometown of Malmo He performed two sets of songs from his four albums, several brand new songs and some hand picked covers. The first set all alone on stage with his guitar and a piano, the second with backed by Micke Nilsson (upright bass), Janne Adolfsson (mandolin) and Svante Sjoblom (National, dobro, banjo). Traditionally, Swedish artists, actors, poets and musicians have had a very romantic notion of Italy. Quit a few have dreamed of travelled to Italy frequently to be inspired.In the case of Richard Lindgren, it got less to do with any romantic ideas. He got invited to tour Italy in the spring of 2014 and as a poor, travelling troubadour you don't decline an offer like that.But once he got there, something happened. It seems like Italy did its magic trick once again. All of the original songs on �Sundown On A Lemon Tree' was written in or at least inspired by Italy.�Sundown On A Lemon Tree' also includes an eclectic selection of covers. Songs that Richard been singing live, or maybe only in the shower, for a long time. Check out Stephen Foster's classic �Hard Times', Jimmie Rogers' �My Blue Eyed Jane', the Irish anthem �Danny Boy' and the Dean Martin hit �Return To Me'. An eclectic selection, indeed.